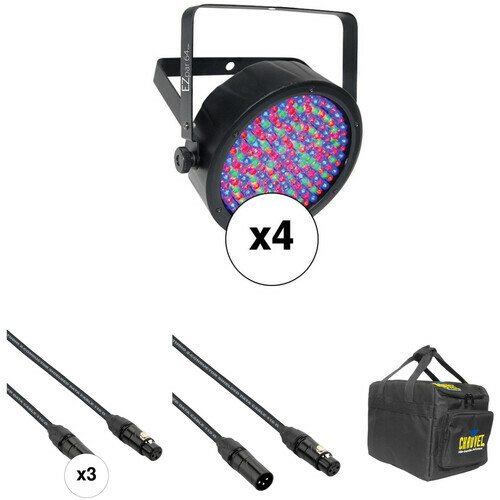 This B&H Kit combines four black CHAUVET DJ EZpar 64 RGBA Battery-Powered LED PAR fixtures with three 5' DMX cables, a 25' DMX cable, and a padded gear bag to create a simple and effective lighting system for mobile DJs, special events, and venue uplighting. The black CHAUVET DJ EZpar 64 RGBA is a battery-powered LED PAR fixture designed to produce amber-infused color washes with rich colors and nuanced shades of pastel. With 180 x RGBA LEDs (red, green, blue, amber), a 14° beam angle, and a 23° field angle, it is well suited for venue up-lighting or dance floor color washing. Compact and lightweight (at 4 lb), the EZpar 64 RGBA is designed with the mobile entertainer in mind. It features a built-in rechargeable battery which lasts up to 8 hours full-on and lets you quickly position your washes anywhere in the venue, regardless of power-outlet availability. The fixture can be used as a standalone with automated programs such as Sound-Active mode, Auto Programs, Color Macros, Static Colors, and Strobe. It can also be controlled via DMX or the IRC-6 infrared remote (included). The master/slave option lets you coordinate multiple units without the need for a controller. Other features include an auto-sensing power supply and a scissor yoke which can be used for conventional mounting to a truss or to create a variable-angle floor stand. Featuring extra-thick 8 mm wire, performance quality connectors, and tension-resistant stress relief, this 5' Pig Hog DMX Cable from Strukture is overbuilt precisely to stand up to the most grueling tour conditions imaginable. Consequently, Pig Hog cables have "no questions" lifetime guarantee. Featuring extra-thick 8 mm wire, performance quality connectors, and tension-resistant stress relief, this 25' Pig Hog DMX Cable from Strukture is overbuilt precisely to stand up to the most grueling tour conditions imaginable. Consequently, Pig Hog cables have "no questions" lifetime guarantee. Store, protect, and transport your lights and accessories with the black CHS-25 VIP Gear Bag for Four SlimPAR 64 Light Fixtures from Chauvet Lighting. A well-designed bag, it has five internal compartments formed by four, padded dividers, and 2 exterior, zippered, accessory compartments. Dual zipper pulls enable quick access to the main compartment. Carry your VIP gear bag with the dual top handles and touch-fastening connector. Box Dimensions (LxWxH) 13.3 x 12.1 x 5.0"
Box Dimensions (LxWxH) 8.5 x 7.5 x 0.75"
Box Dimensions (LxWxH) 8.5 x 8.0 x 1.5"
Box Dimensions (LxWxH) 12.0 x 9.5 x 8.0"